5 Pilates Exercises You Can Do At Home! No equipment or gym needed! Just a soft surface and enough room to get down on the floor and move your arms and legs unobstructed! These 5 are among Joe Pilates’ original classic 34 mat exercises which he created 100 years ago! They are also among the Pilates exercises done by nearly all pro athletes for their unsurpassed ability to strengthen the core. This is one of the most common and well-known Pilates moves, and if you end up going to a class, you’ll likely be instructed to do it. It’s designed to get your blood pumping, as well as working your core muscles. Put your legs straight up in the air, roughly on a 45 degree angle. Curl up, pressing your abs to the floor and head forward. Hover your arms right above your abs and start to pump your arms up and down, taking deep breaths, inhaling for 5 counts, exhaling for 5 counts. Repeat 10 times, without taking a break. Rest your head flat on the floor, rather than curling it up, if the move feels too difficult. This simple exercise lets you work out your abs by moving your legs. 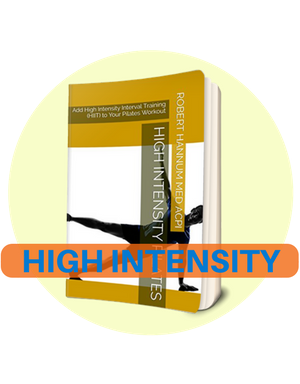 Lay down on the mat, shoulders down, abs to the floor, and extend your right leg straight up to the sky. Keep your left leg flat on the floor. If it’s hurting, it may help to bend your non-circling leg, rather than keeping it flat on the mat. Circle your right leg across your body to your left shoulder, then back around to your right shoulder. Focus on keeping abdominals pressed in by sucking in your belly button. Repeat five times, then switch legs. This stretch focuses on the sides of your body, really lengthening and tightening. In a seated position rest on your right hip with your legs folded together to the left side (like a mermaid). Place your left hand to the side, and hold your right arm straight up in the air, grazing your ear. Make sure you’re sucking in your tummy and abs, then reach your right arm towards the ceiling, and then out and over to the left, making sure your arm stays straight. You should feel a stretch along the right side of your body. Repeat twice and repeat on the opposite side.